An Eilenberg–like theorem is shown for algebras on a given monad. The main idea is to explore the approach given by Bojan´czyk that defines, for a given monad T on a category D, pseudovarieties of T–algebras as classes of finite T–algebras closed under homomorphic images, subalgebras, and finite products. To define pseudovarieties of recognizable languages, which is the other main concept for an Eilenberg–like theorem, we use a category C that is dual to D and a recent duality result between Eilenberg–Moore categories of algebras and coalgebras by Salamanca, Bonsangue, and Rot. Using this duality we define the concept of a pseudovariety of languages based on the category C, which is the main difference and generalizes Bojan´czyk’s approach. 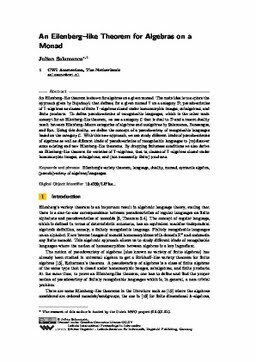 With this new approach we can study different kinds of pseudovarieties of algebras as well as different kinds of pseudovarieties of recognizable languages to (re)discover some Eilenberg–like theorems. Salamanca Tellez, J.R. (2016). An Eilenberg-like theorem for algebras on a monad. Formal methods [FM]. CWI.